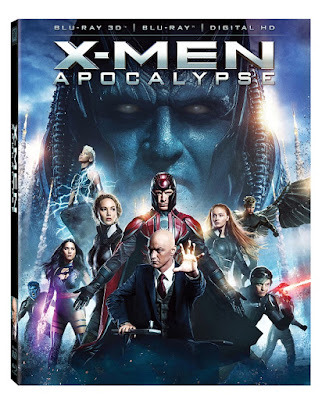 In “one of the coolest superhero movies of the decade” (Richard Roeper, Chicago Sun Times), Twentieth Century Fox Home Entertainment fights to save the world from a near “Apocalypse” in the suspenseful and wild film – X-Men Apocalypse. The most talked about X-Men film arrives on Digital HD on Sept. 9, 2016 and Blu-ray, 4K Ultra HD and DVD on Oct. 4, 2016. X-Men Apocalypse reunites the fan-favorite trio of OSCAR® Winner Jennifer Lawrence* as Raven, Michael Fassbender as Magneto and James McAvoy as Professor Charles Xavier – who lead a powerhouse cast including Olivia Munn as the mesmerizing Psylocke, Sophie Turner as Jean Grey and Evan Peters as the comical Quicksilver. In director Bryan Singer’s extraordinary follow-up to X-Men: Days of Future Past – Apocalypse – the world’s first and most powerful mutant – has awakened to find a world led by humans. Intent on cleansing the Earth of mankind, he recruits a group of mutants to create a new world order. In a desperate race to save humanity, Professor X (McAvoy) leads the young X-Men in an epic showdown – against an unstoppable enemy – that will determine the fate of the world. Both my husband and I have been a big fan of the X-men movies so we were so very excited to see X-Men: Apocalypse . We were not disappointed in this movie at all. It is so very well done and the story is fantastic. I have to admit I loved every minute of this movie . If you are a fan of X-men like I am I think you will want to movie to add to your collection. I do highly recommend this movie. You can now purchase this movie online or in stores near you.